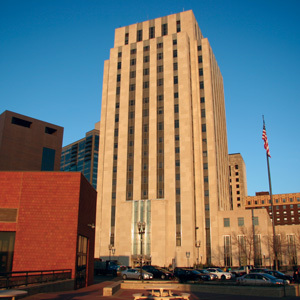 The Saint Paul City Hall and Ramsey County Courthouse, located in downtown Saint Paul, contains offices for the Ramsey County Board of Commissioners, County Manager and Law Library, as well as the Mayor and City Council of Saint Paul and the State of MN Second Judicial Courts. Saint Paul City Hall and Ramsey County Courthouse is a 21-story monument to Art Deco high-rise architecture. Scheduled public hour-long tours are offered by the Ramsey County Historical Society Mondays at 12:15 p.m. Tours by appointment are also available. Call 651-222-4786 or email courthousetours@rchs.com. Memorial Hall and Vision of Peace statue. Council Chambers, Mayor’s Office and courtroom. Woods (23 varieties from 18 countries) and marbles. Self-guided tours can be taken during regular building hours. Learn more about the history of 1920s and 1930s Art Deco throughout the Twin Cities by listening to this radio broadcast.